Last year, I was browsing through a Williams Sonoma catalog and I flipped to a page with a picture of one of the most amazing-looking pancake nibbles that my eyes ever saw. Everything in the Williams Sonoma catalog is drool-worthy, but this pan, I had to buy this pan and make those stuffed flapjacks. I had to. This investment definitely hits the top of my list. Now I can’t stop making ebelskivers. I make them for the fam., I brought my pan to a friend’s house (she’s got hungry brothers, and her hungry brothers have hungry friends…so we whipped up these ebelskivers for a snack and then later in the evening for dessert…we went through an entire box and a half of pancake mix and a menagerie of fillings), I brought my pan up to school with me, and I just brought my pan back home for Thanksgiving break. Basically, you mix up some your favorite pancake batter, decide on your filling of choice, and well, there you have it—ebelskivers! Brush the hole with a bit of butter, fill with about a tablespoon of batter, dollop about a teaspoon of filling, and top with another tablespoon of batter. Wait until it bubbles, and flip. I like to use two wooden skewers to flip my pancake balls, but you can also use two spoons if you like. Your filling can be anything from grand to bare-bones simple. You do not even need filling if you just want your pancake in the shape of a mini tennis ball. One of my favorite fillings is goat cheese (or feta cheese) mixed with jam. The cheese gets all melty and the jam/cheese combination is so satisfying! 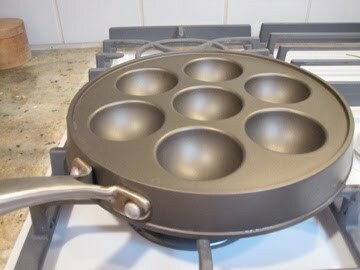 Go splurge and buy this pan. They are anywhere from 25-40 dollars (Bed, Bath, and Beyond or Williams Sonoma or Sur la Table will definitely carry them). 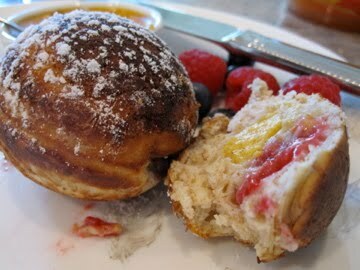 Oooo, and check out this video of Rachael Ray making ebelskivers! Here is a second video in case you want another tutorial on how to use the pan. 1. In a medium-size mixing bowl, prepare your pancake batter. 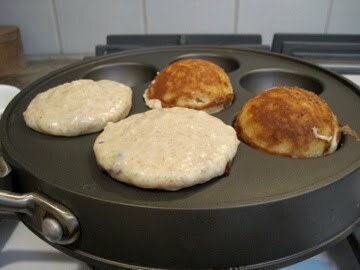 Have your filling in a small dish next to your batter as you’ll need it quickly once you start cooking the ebelskivers. 2. 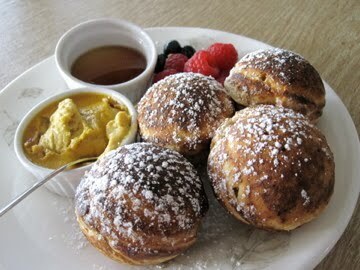 Place an ebelskiver pan over medium heat. Melt your butter in a separate dish and brush your pan with a bit of butter. 3. Using a spoon, fill each dip in the pan about halfway with the batter (about 1 tablespoon of batter). Using another spoon, place a small dollop of your filling into the center of each indent on the pan, leaving a ring of batter all around it to enclose it in the pancake. Top each indent off with another small dollop of batter. 4. Allow the pancakes to cook for about 1 ½ minutes, until light golden brown on the outside (you can check them by lifting them up with a skewer, teaspoon or the tip of a knife). 5. Using two skewers, teaspoons, or paring knives, flip each pancake over in its indent to cook the other side. Allow the pancakes to cook for another 2 minutes, then remove them to a plate until you’re ready to serve them. 6. Continue the above process until you’ve used up all of the batter. 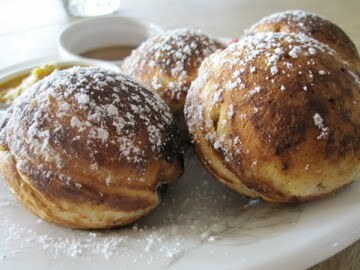 Serve up the ebelskivers as soon as they’re finished cooking with a dusting of powdered sugar, if you like.